The House Hunt describes how to purchase your first home, including such components of the process as searching for the house, contract negotiation, getting a loan, inspections, and closing the deal. 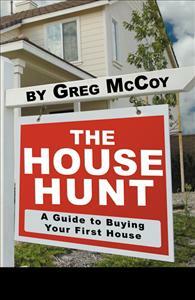 The House Hunt is an informative book describing how to purchase your first home. The author is an experienced Real Estate agent, sharing his knowledge with readers to help them prepare and know what to expect. The book begins with a discussion of whether or not the reader should consider buying a house, including a comparison of renting vs. buying. It then proceeds to provide a detailed roadmap of the process of looking for a house, negotiating a contract, getting a loan, getting inspections, and closing the deal. The author includes a glossary of Real Estate terms and several charts to assist the buyer in estimating monthly loan payments.